Mitt Romney is kicking off a three-day tour through Ohio, the state he badly needs to win, where Barack Obama has held a stubborn lead for months. Not surprisingly, Romney’s arrival coincides with a new ad hitting Obama for being too soft in pushing back against China’s trade violations. Romney’s been hitting this protectionist line since early in the Republican primaries, which has raised eyebrows coming from a man who has thrived on the realities of global capitalism as much as he has. 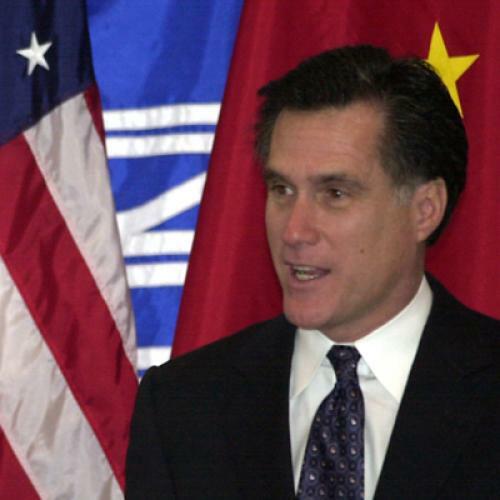 But I recently came across a remarkable video clip from just three years ago that shows just how radically Romney has shifted on the subject of trade with China. While reporting a possible piece on Romney’s foreign policy, I discovered a video of a luncheon chat that Romney held in September 2009 at the Foreign Policy Initiative, the organization founded by Bill Kristol to advance the neo-conservative cause. Romney spends most of the discussion pressing a muscular line on the Middle East, Russia and elsewhere. There is an amusing backdrop to the event -- the moderator is Dan Senor, the former Bush administration spokesman in Iraq who tutored Romney on foreign policy during the 2008 campaign and is now a leading advisor on his 2012 team. In replying to Senor’s questions, Romney often turns back toward him as if for approval; after all, Senor helped Romney craft the answers. But near the end of the luncheon, at the 31:30 mark, there is a question from Senor about Obama’s decision that same month to slap tariffs on cheap Chinese tires flooding the U.S., imports that the administration argued violated WTO rules. The question sets Romney loose – he launches on a long, fluid disquisition with nary an affirming glance at Senor. I am going to give the answer in full, because it is quite striking in light of Romney’s current anti-China rhetoric. The particularly eye-catching lines are in bold, but I wanted to provide the full context. Senor: There is a major trade issue in the news now regarding China and our protection of the tire manufacturing industry. What is your reaction to this controversy and the decision by the administration? Romney: I’m glad I can address that in this room, because this is a sophisticated audience and my answer cannot be boiled down to a couple of lines. There is understandable resistance on the part of almost all people to any change that would provide additional productivity. Now, you hear all around America, everyone cheers productivity, but that’s just because most people don’t know what it is. They think productivity means everyone’s working harder and faster and better and therefore we’re all doing better. But productivity really means that more stuff is being created by fewer people. If a nation is highly productive it means that fewer people are able to make more and more stuff. And the nation’s wealth is a function of how productive it is, how much stuff is made by its people, and if you want to see wealthier and wealthier people, you want to see more and more productivity, or more and more things made by the people of that nation. A lot of people don’t like that idea. You may say, sure, everybody does. A simple example -- let’s pretend there’s a little country with 200 people. This is a long time ago -- 100 people raise the food, 100 people build the homes. Someone comes up with the idea of making a plow, hitching it to a farm animal and now they only need 50 people to raise the food. Is that a good idea or a bad idea? To the 50 people who lose their jobs, it’s a very bad idea, and they will resist with great energy and passion the idea of allowing horses to draw plows because it will make their life far more uncertain, at best. Those of us who stand back a bit say, no no no, don’t you understand that by having these plows and releasing those 50 people that someone, one of them or someone else is going to come up with something else for them to do? Making chairs, making movies whatever that is going to make everyone better off. More productivity will make everybody wealthier and more successful. And that is something which is lost on a lot of people in this country. The tire workers of America look at these tires coming in from China and say this is not good for me. And I understand that and they -- and the corporations, it’s not just the unions by the way, it’s the corporate executives and the shareholders and all the wealth owners, capitalists behind the tire industry -- are saying don’t let those foreign tires in here, it’s gonna hurt me. And it will -- as those tires come in it does hurt them directly, and therefore what their response is, their immediate response is, don’t let them in. But if that’s what their response is, my experience is over time, they will lose out slowly but surely, as they protect their lack of productivity with barriers, they will become less and less competitive, the foreign guys will get more and more volume, more and more successful, they’ll become more and more productive, the domestic guys get less and less productive, less and less competitive, until finally even the tariff can’t hold them out and the foreign products come flooding into the marketplace and the domestic guys are gone. So putting barriers up, trying to put walls up, in my opinion is a defeating strategy and will yield ultimate decline and collapse. The alternative strategy, by the way, as you know is, to say, OK, those guys have figured out a way to make tires in a more productive way than we have, and we’re going to have to find another way to compete. We’re going to have to find a way to use our ingenuity and our investments, new capital, we’re going to have to find way to compete or we’re gonna be gone. And so we’re gonna either close the doors today or we’re gonna compete head on. And by the way, the same is true in the automotive industry. We’ve watched our market share go down, go down, go down, because we are not productively competitive with foreign manufacturers and transplants that are here. If we invest in productivity here we can be globally competitive. So, long story short, the wrong answer for America’s workers and for the wealth of every citizen of this nation is to try and put up barriers to stop competition, either domestic competition or competition from abroad. The right answer is always to see competition as an opportunity and a necessity for investment, innovation, technology and becoming more productive. If we do that we’ll be a wealthier nation and we’ll be able to remain the powerful nation we must remain to have a strong and powerful military, which we must have to protect freedom. Romney has given voice to this anti-protectionist stance at other moments, including on page 119 of his 2010 book No Apology, in which he wrote, simply, “President Obama’s action to defend American tire companies from foreign competition may make good politics by repaying unions for their support of his campaign, but it is decidedly bad for the nation and our workers. Protectionism stifles productivity.” But I’ve never seen him go on at such length, and with such conviction, as in that Foreign Policy Initiative clip. Now granted, inconsistency on China and trade is a hallmark of modern American presidential campaigns – for all of Obama’s moves against China, including the tire tariff, they fall short of the rhetoric he was using on the trail in 2008. Question: How does a president go after China? How does that work? ROMNEY: The actions a president can take are, No. 1, to declare China a currency manipulator. And under our law, that allows the president to apply tariffs in places where the president believes that China's practices are killing American jobs. Question: It's a certainty that China would retaliate in some way, and very likely in a way that could harm American jobs in the middle of this fight. Is this the kind of fight you really want to pick? ROMNEY: Well, you know, I understand there's always an argument to say let the cannibal -- pay the cannibal to eat you last. But you can't sit there year after year and allow a country like China to violate the principles of free trade and free enterprise. And I happen to believe that given the fact they sell us about this much stuff a year and we sell them about this much stuff a year, they`re not likely to want to engage in a trade war. Fewer Americans are working today than when President Obama took office. It doesn’t have to be this way, if Obama would stand up to China….Seven times Obama could have taken action, seven times he said no. His policies cost us 2 million jobs….Obama had years to stand up to China. We can’t afford four more. Well, there was one time Obama stood up to China. And Mitt Romney, speaking behind closed doors to a “sophisticated audience,” explained why he was wrong to do so.